For a long time, the gym was one of the only places that you could go to be in a “group” exercise class. Recently, there has been a rising trend of working out at home or on the go with various fitness apps. From iPhone and Android apps to bikes, treadmills and ellipticals that can connect remotely to a class, working out remotely is on the rise. However, this rise comes with its pros and cons. 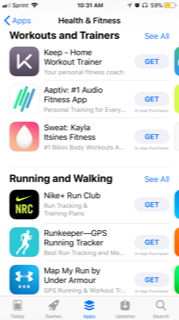 Just look through the app store on your various devices in the fitness category and see how many different options there are. 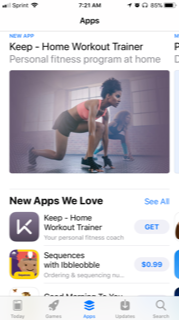 The first app on the homepage of the app store is a new fitness app marketed as a workout trainer. There are apps for weight loss, strength training, running, the mental aspect of fitness and there are even apps that pay you to workout. Yes, you read that correctly, there are apps that pay you to workout. The connected cardio equipment is an interesting concept. On your bike, treadmill or elliptical, you can connect directly to a class that is taught by an instructor and participate directly from your own home. These do come with a big price tag and subscription fees, but there is no excuse to miss a workout anymore. In today’s society, people like to have choices. And with people’s busy schedules, working out on their own time, wherever they want, is making it easier to get and stay fit. These devices and apps give you many more choices than you used to have. Look around next time you go out, anywhere, and you will see a lot of people have some kind of fitness tracker. These fitness trackers are making it easier to keep track of your daily activity and people get obsessed with hitting certain benchmarks (Props, 2017). Whatever gets you off the couch and moving is great. But, that is where some of the problems arise. In a gym setting or in a group exercise class, there is accountability. People become accustomed to seeing you on certain days at certain times and help push you to go on days when you just don’t want to go. With these apps though, you lose some of the accountability and the camaraderie of a typical gym or group exercise class. It’s much easier to continue to sit on the couch NEXT to your treadmill when you know nobody is watching. 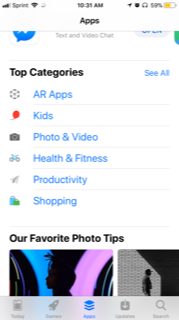 If you are going to use any of these apps, be sure to do your research first. The free apps provide a great place to start, but some of the features you need to pay for. Before you pay for any of the apps, read about it and make sure it is something you are going to do. For the strength training apps, make sure you have a solid base first so you have some idea of what’s going on. For example, you shouldn’t be doing a power clean before you even know how to do a squat, so just be sure whatever you choose is on par with your ability. Or, if you are not sure what you are doing, go to a gym and ask. Maybe get a few sessions with a personal trainer to make sure you are doing things correctly. If you aren’t, then you could be doing more harm than good. Look into the pricing for the connected cardio equipment. It might seem like a great deal when you are just buying the equipment. But the price tag for some of the subscriptions will run at least thirty dollars a month. For that price you can get a gym membership and get group exercise classes. So, if convenience is your thing and you don’t mind the subscription fees, then go for it - whatever gets you moving. But, if you are not going to use it consistently, a traditional gym may be more your style. The fitness apps and connected equipment are great. They are getting people moving and keeping up with their busy lifestyles. There are a lot of pros going for these, but with the pros come the cons. Convenience has a price. Do your research and find what suits you the best. Whatever you do, just get up and do something! Props, A. (2017). Wearable tech. Retrieved from: http://www.ptonthenet.com/blog/the-inner-unit/wearable-tech-930. 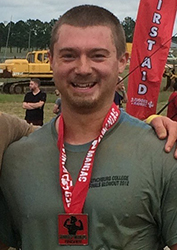 I graduated from the University of Lynchburg (formerly Lynchburg College) in 2015 with a Bachelor’s Degree in Sports Management. I am a NSCA Certified Strength and Conditioning Specialist (CSCS), USA Weightlifting Sports Performance Coach and NASM Certified Personal Trainer. I played baseball at Lynchburg for two years before injury forced me to ‘retire,’ which is when I found my passion for health and fitness. While at Lynchburg I completed my internship with the Strength and Conditioning Department where I worked with numerous sports teams. I worked with the men’s and women’s lacrosse, softball, baseball and field hockey teams. The men’s lacrosse team played in the Division III National Championship Game and the field hockey team won their ninth straight Old Dominion Athletic Conference (ODAC) championship. 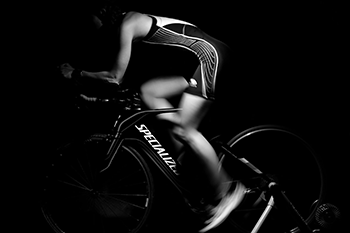 I was a Sports Performance Coach at Elkin Sports Performance where I work with athletes in elementary school, middle school, high school, college, professional and adults. We do speed, agility and weight training. I worked at the YMCA for nearly five years as a wellness coach, personal trainer and group fitness instructor. I started a group personal training class called, ‘Own The Gym,’ where I teach the class how to train and why they are doing certain movements.